According to religious tradition, the Children's Crusade was a mass movement, begun in the year 1212, in which a lone shepherd boy, having had instructions from Jesus in a vision, through the force of his faith and personality gathered thousands of children and prepared to lead them to Palestine with the intention of conquering it for Christianity and of recovering the True Cross. In this version, the children’s movement spread with heaven-directed alacrity throughout Europe, attended by miracles, and was even blessed by Pope Innocent III, who is supposed to have proclaimed that the faith of these extraordinary young ones "put us all to shame." The charismatic boy who fronted this movement was universally recognized as a living saint. Some 30,000 human beings were ostensibly involved in his crusade, most of them twelve years of age or younger. These innocent marchers traveled southward towards the Mediterranean, where, they had been led to believe fervently, the sea would part to enable them to march straight on to Jerusalem unimpeded, just as the Red Sea had opened so that Moses could lead his flock out of Egypt. When this miracle did not occur, several merchants gave passage on seven ships to as many of the children as the vessels could hold. However, the children were either taken to Tunisia and sold into slavery or died in a shipwreck on the island of San Pietro (off Sardinia) during a gale. In some accounts, they never even reached the sea before dying of starvation or giving up their crusade because of exhaustion. In the first children’s movement, Nicholas, a ten-year-old shepherd from Germany, led a group across the Alps and into Italy in the early spring. Hundreds—and then thousands—of children, but also adolescents, women, the elderly, the poor, parish clergy, and a fair share of petty thieves and prostitutes, joined him in his march south. He indeed believed that God would part the waters of the Mediterranean so that his “army” could walk across the dry seabed all the way to Jerusalem to convert the Muslims with love (a great departure from the earlier belief that the children were warriors who would “conquer”). The common people of southern Europe greeted the marchers as heroes when they passed through the towns and villages, but the educated class and the clergy criticized them as being deluded. In August, Nicholas's group, which had splintered in the course of its long trek, reached Lombardy and various port cities. Nicholas himself arrived with a large contingent at Genoa on 25 August 1212. To their great disappointment the sea did not open for them, nor, alternatively, did it allow them to walk across the waves to their destination. From this disillusionment (Jesus walked on water, why could they who adored him not also do so? ), many set out to return to their homes. Most did not make it back that far. Others remained in Genoa. Some appear to have marched on to Rome, where the embarrassed Pope Innocent III indeed praised their zeal but released them from their vows as crusaders and sent them away. Although the Pope did not encourage them to continue their march, stories of their faith may have stimulated future efforts by official Christendom to launch further crusades. Nicholas’s fate is unclear. Some sources state that he eventually joined the Fifth Crusade, others that he died in Italy. The alleged second movement was led by twelve-year-old shepherd Stephen de Cloyes, who originated near the village of Châteaudun in France. He claimed, in June 1212, that he bore a letter from Jesus to the French king. Stephen had met a pilgrim who asked for bread. When Stephen provided it, the beggar revealed himself to be Jesus and gave the boy the letter, designating it to be for the reigning monarch, Philip II. The contents of the unpreserved letter are unknown, but it is clear that the king, who had already been to the Holy Land, was loath to lead another crusade. Still, Stephen attracted a large following, which he led to Saint-Denis, where he was reportedly seen to work miracles. However, on the advice of clerics of the University of Paris and on the orders of King Philip, Stephen’s followers were commanded to disperse back to their homes. Apparently, most of them obeyed. None of the contemporary accounts mentions this band as having headed on to Jerusalem. This leaves us with the original theory of one boy, one crusade, that of Nicholas, many members of whose army of disciples are at least credited with beginning the sea journey. Legends of both miracles and tragedies (being forced into slavery or drowning en route) associated with the Children's Crusade abound, and the actual events continue to be a subject of earnest debate among historians. Though modern scholarship has challenged, in particular, the traditional view, asserting that the Children's Crusade was neither a true crusade nor made up of an army of children, and that the Pope did not call for it, nor did he bless it, it does acknowledge an historical basis for the legend. Namely, it was an unsanctioned popular movement, the beginnings of which are shrouded in uncertainty and the ending of which is just as difficult to pinpoint. The composer turned fifty-two not long after that 1963 Cincinnati premiere, and though he wrote a great deal more music for the stage (he died at ninety-five on 1 February 2007), his Bishop of Brindisi was the last genuine triumph of his career, the last work acclaimed and universally commended not just by its first audience but by the professional commentators present to hear it as well. Like all else Menotti ever wrote that had text, the words are his own. The poetry is rather extraordinary, the thoughts and feelings it expresses not purveyed in easily grasped phrases, and it imposes a profound obligation upon the singers, particularly the interpreter of the Bishop (who has the most to sing and myriad philosophical musings to convey), to make ourselves understood. 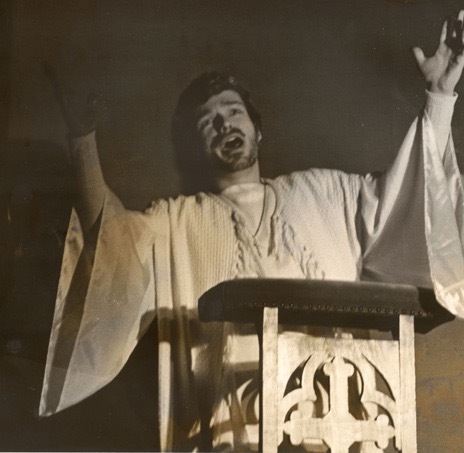 If there is anything in which I can take special pride, it is that on the recording made from the local radio broadcast (this production took place in Fort Worth, Texas, in 1974) every word I sang can be clearly comprehended. Responses to the performance over the years have invariably begun with that observation. It was included in the immediate reaction of those present on the live occasion itself. I remember the audience members approaching afterward in all manner of moods, from the lady, still visibly shaken, who said simply, “I don’t know when I have ever been so moved by anything,” and then hurried away, to the one who exclaimed in apparent astonishment, “I understood every last word!” The reason for the first statement, of course, is Menotti himself, who poured not just heart and soul and, ultimately, perhaps a sense of hope, but all his doubts about God, faith, and man’s place and duties in the cosmic scheme (if, indeed, there is such a thing and it is “directed”) into his score, each episode of which strikes exactly the right musical and textual mark to channel not only his characters’ deepest feelings but to reveal the composer’s own as well. 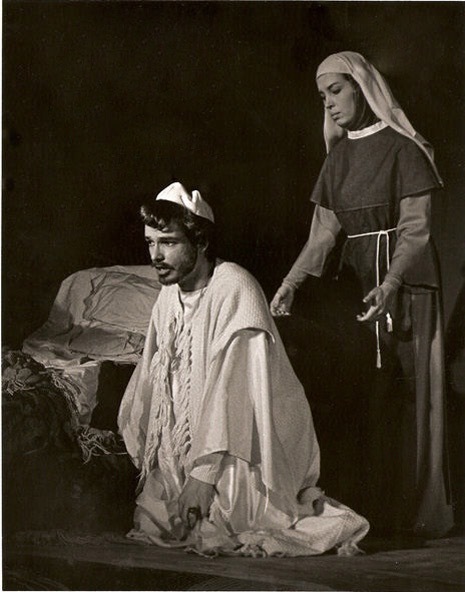 It helps, of course, to have so fine a colleague as the wonderful mezzo Linda Rasmussen (a lifelong friend, met in grad school in Boston) in the other role, the doctrinaire but not unsympathetic nun who cannot immunize the Bishop against his doubts and fears with her impregnable, unexamined thirteenth-century faith, who enjoins him not to ask “vain questions,” and who finally tells him just to say his prayers because he’s about to die. Linda was able to temper the Sister’s rigidity through her lovely tone and serene manner. --Give me an enemy to kill, O Lord, but not a child to help! --Do not call for help, my children. Love has no wings and faith is fallible. --Many are the innocents who call for help, but God has made Pilates of us all. Although it was apparently foreordained that my association with The Bishop would be limited to one production, it did not always seem that such would be the case. 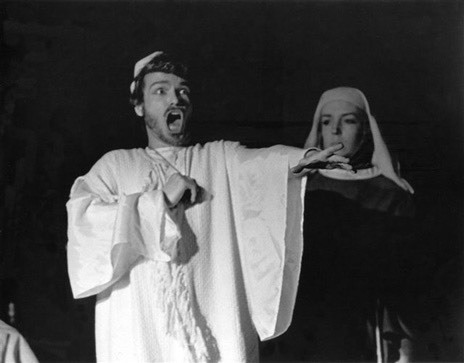 A musician acquaintance of an acquaintance in New York had studied with both Menotti and his protégé, Thomas Schippers, and was familiar with the opera, which he loved, from its incarnation on a 1964 RCA Victor recording. He was very interested in hearing any other audio version that might exist. 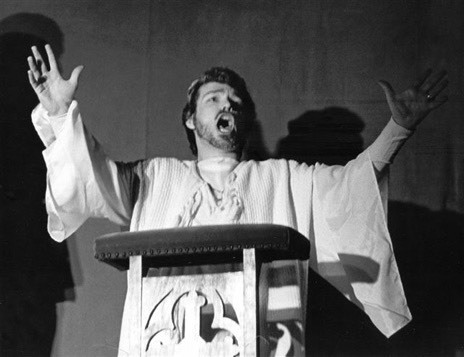 The role of the Bishop had been created by the twenty-seven-year-old lyric bass Richard Cross, a Menotti favorite, but the recording, which is what made the work known to the music-loving public in general, featured the great heroic bass-baritone George London, toward the end of his career, after vocal troubles had set in. London’s voice and manner conjure an aging Wotan striding the crags surrounding Valhalla, or the corrupt, guilt-ridden Boris Godunov railing at the Duma, not the aesthetic little Bishop whose faith has been sorely tested by what he perceives as the results of his coerced blessing of some fanatic children demanding to have their mission consecrated by one of God’s intercessors. True, the man is as guilt-ridden as Boris, but in his case the deaths for which he feels responsible were in no way intended by him. 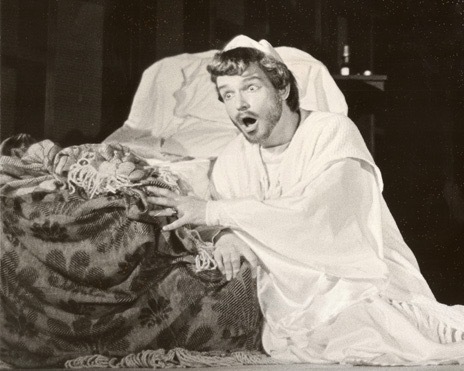 His conscience is rent because of his faith, not because he has with forethought committed murder, and he very specifically must remain poignantly human and ought not to be made “larger than life” in the way operatic gods and tsars must be.